Jenna Marbles is an American YouTuber, Vlogger, and Actress who is known for her eponymous YouTube channel, which has earned over 17.7 million subscribers. With that, her YouTube vlog is the 28th most subscribed channel on YouTube and the second most popular channel operated by a woman. This fascinating lady becomes the first social media star to have a wax figure displayed in Madame Tussauds Museum, located in New York City. Jenna was born on 15 September 1986, in Rochester, New York, United States. 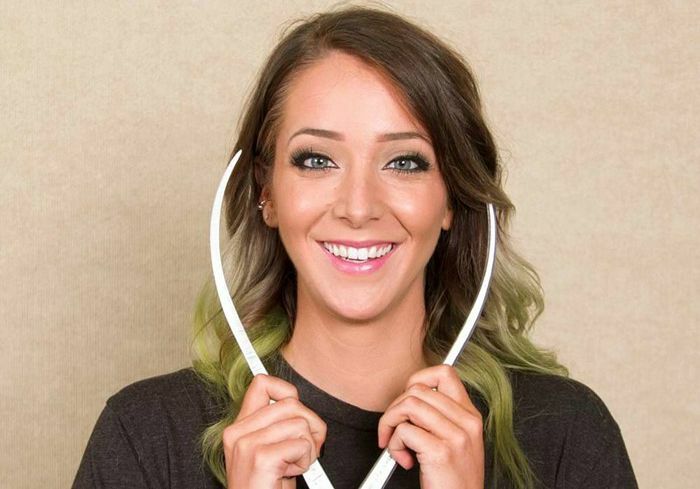 Jenna Marbles graduated from Brighton High School in 2004. Later, she got herself enrolled at the Suffolk University in Boston and graduated with a Bachelor of Science degree in Psychology. She then joined Boston University from where she completed her Master’s degree in Counseling and Sports Psychology. Jenna Marbles has been dating fellow YouTuber, Julien Solomita from 2013. Both have appeared in several videos on each other’s channel. Before Julien, Jenna has dated another YouTuber, Max Weisz from 2008 to 2012. She has taken up breast implants. She wears a size 8.5 (US) shoe. Jenna first appeared in the comedy movie, Road Hard, playing herself, in 2015. In 2011, Jenna first appeared on the talk show, The Moms View. Jenna Marbles has an estimated net worth of $5.5 million. She makes money from multiple platforms like writing for stoolala.com, YouTube revenue, and also has her own line of dog toys called Kermie Worm & Mr. Marbles. With more than 17 million subscribers to her self-titled YouTube channel, Jenna is one of the most followed female star on the platform that brought her immense net worth. She lives with her partner in a rented luxury house in Santa Monica, California. Before trying her luck on YouTube, she did a couple of odd gigs like bartender and also worked at a tanning saloon. Her breakthrough video on YouTube was How to trick people into thinking you’re good-looking which graced more than 66 million views and still counting. In March 2017, she started a new weird beauty trend with her video A Full Face of Rhinestones, which saw several beauty vloggers sticking rhinestones on their faces. She holds the distinction of being the first YouTube personality to have a wax figure at the Madame Tussaud Museum in New York. The dog toys she manufactures under brand Kermie Worm & Mr. Marbles are inspired by her three dogs, Marbles (a chihuahua), Kermit and Peach (both Italian greyhounds). In 2016, Marbles became an executive producer for Maximum Ride, a film based on the series of novels of the same name by James Patterson.